The humpback whales that breed in Oceania are special for several reasons. 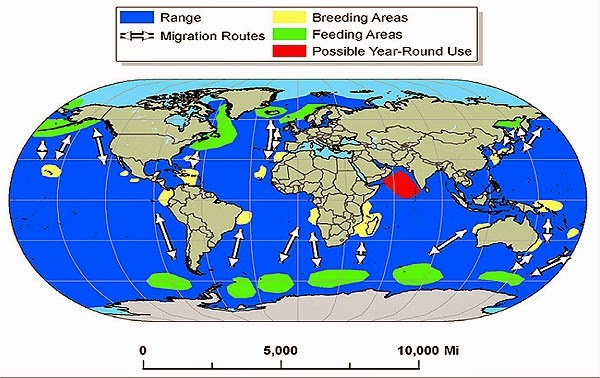 First, we don’t have a detailed understanding of where they go during their annual long-distance migrations. In fact, the two humpback whale migration tracks that capture full southward movements between the tropics and higher latitude feeding grounds challenge the idea that humpback whales follow simple north-south migration corridors (as suggested by whaling records). Second, there are weak but significant genetic differences between the (at least) four Oceania breeding areas (E2 = New Caledonia; E3 = Tonga; F1 = Cook Islands; F2 = French Polynesia). Recent research has further demonstrated that these 4 sub-populations are also weakly but significantly different than both the east and west Australia populations. Third, the Oceania humpback whale population as a whole is not recovering from whaling as quickly as other populations. Best available science suggests the western Australia population has already recovered, if not exceeded, pre-1934 levels, while the eastern Australia population has increased from <100 indivudals in 1963 to approximately 15,000 today - roughly three-quarters of the way to a full pre-1934 population level recovery. 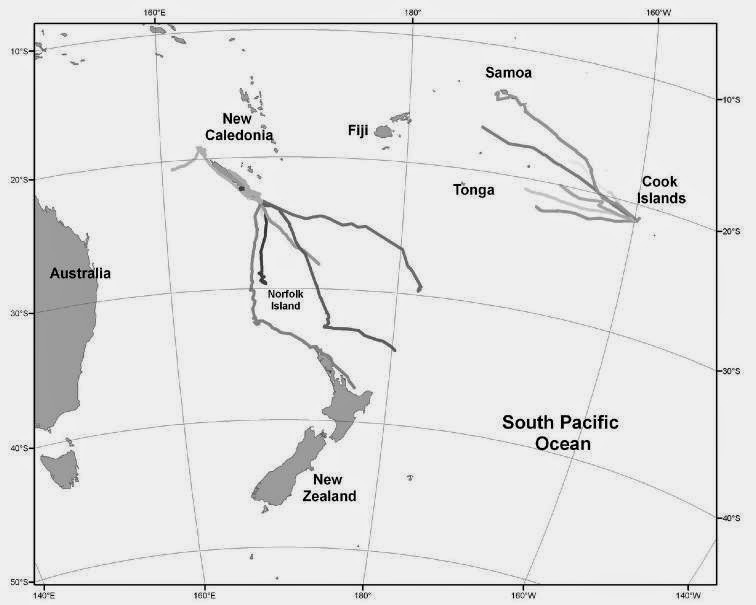 In stark contrast to their neighbors to the west, there are only ~5,000 humpbacks dispersed across the four Oceania breeding areas – one-tenth the size of the best guess pre-whaling population. Humpback whale satellite tagging tracks of the first few weeks of their 2007 "southward" migrations (Clapham et al., 2007; IWC SC-60-SH23). The reason why these whales don't take the shortest route to their southern feeding grounds (i.e. by swimming due south) remains a mystery - one that we are trying to solve this year in Rarotonga. Oceania humpbacks are special because we know so little about them: we don’t know where they go during their migrations; we don’t know the extent to which whales from the different areas intermingle; we don’t know why their recovery rate is so relatively slow. There is a tremendous amount of important science yet to be done! One thing we do know about Oceania humpbacks is that the threats they face on the high-seas are increasing every year (e.g. entanglement in fishing lines; collisions with ships; sonic pollution from marine resource exploration; exposure to contaminants and rubbish). Thus, a compelling case exists for fundamental data collection and public education/awareness programs aimed at Oceania humpback whale recovery. One of the over-arching reasons why Oceania humpback whales remain such a mystery is that not very many people study them. In fact, I can list on less than one hand the heroines and hero of Oceania humpback whale research. From west to east they are: Claire Garrigue, New Caledonia; Nan Hauser, Cook Islands; Michael Poole, French Polynesia. Oceania is a VERY big piece of ocean – larger than the whole of the U.S.A. To think that there are only three scientists on the conservation biology front lines leading the charge to improve our scientific understanding of endangered humpback whales is troubling to me. Now please, don’t get me wrong. Indeed, there are many scientists doing excellent work on Oceania’s humpbacks. My point is: most of these scientists (myself included in this lot) don’t actually live in Oceania. I think it’s fair to say that without Claire, Nan, and Michael providing that essential locally grounded and locally committed – community based - research platform, we’d know far less about Oceania humpbacks than we do today. More than anyone else, Claire, Nan, and Michael are the heroes of humpback whale conservation across Oceania. Their contributions to the betterment of the planet should not go unheralded.